The Silencer Mk II 750W from the power supply experts at PC Power & Cooling is another leap forward for the legendary Silencer line. A thorough update, the Silencer Mk II strikes the right balance between server-class industry standard topology and the cutting-edge of enthusiast computer power supply design. Built with industrial and professional power users in mind, key features of the 750W Mk II include a Single +12V Rail for maximum and efficient power distribution, a generous thermally controlled 135mm double-ball bearing fan for maximum airflow at near-silent audible noise levels, extremely tight and well regulated electrical noise and ripple, an ideal array of connector types for each wattage, and ultra-high efficiency, converting up to a full 88% of AC to DC power at typical loads. The Silencer Mk II Series is power-packed, built to last, and fully compliant with the latest ATX12V and EPS12V specifications. 80 PLUS SILVER Certified The 80 PLUS SILVER certified power supply provides high power efficiency of at least 85% at any load between 20% and 100%, saving your money on your electrical bill, reducing heat in your computer's system and prolonging its life. 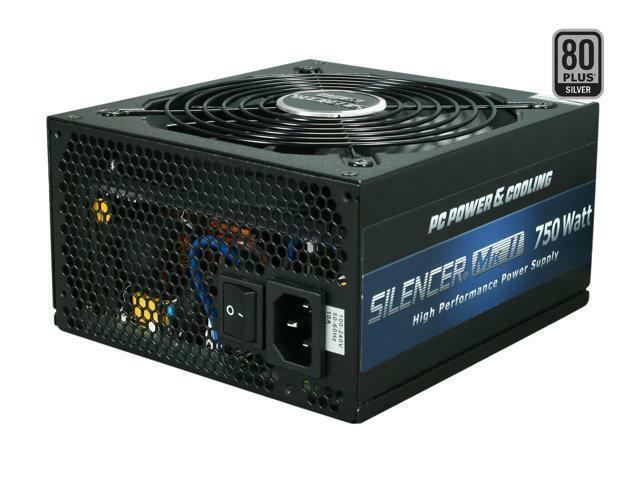 750W Continuous Power with Powerful Single +12V Output The PC Power & Cooling Silencer Mk II 750W power supply delivers reliable 750W of continuous output (880W Peak) at a temperature rating of 50ºC. Robust and dedicated single +12V rail @ 62.4A ensures the maximum provision of 12V power to energy-hungry components such as CPU and VGA card. NVIDIA SLI Certified The PC Power & Cooling Silencer Mk II 750W power supply has gone through a series of rigorous NVIDIA SLI certification tests for maximum system stability when building NVIDIA SLI PCs. 135mm Ultra-quiet Fan Intelligent thermal fan speed control on the 135mm ball bearing fan guarantees cooling performance as well as extremely silent operation. A complete array of connectors Besides the 20+4 Pin motherboard connector, the power supply comes with one 8 Pin & one 4 Pin CPU connectors, 2x 6 Pin & 2x 6+2 Pin PCI-E, 8x SATA and 7x peripheral connectors for maximum platform compatibility and expansion capabilities. Pros: -750W good for upgrading video cards and not worrying about power consumption. -cooling fan built into supply/ plenty of ventilation. Other Thoughts: -Has not failed in the 5 years I have owned it. Bought it in a bundle pack with an ATI Radeon HD 6970. Works great with my updated system with an ATI Radeon R9 290X and over clocked I5 3570K running at 3.8Ghz. Pros: Used in my personal build with mostly AMD parts for years and never had an issue. Pretty quiet compared to other PSUs I've used. Cons: Really long cables, make sure you're able to store the excess in your case. I would not use this for a case smaller than a mid tower. Other Thoughts: The cables aren't totally black, they have a slight color to signify what kind of cable it is. It's a nice touch for newer users, but as time grew, really wish the cables and connectors were all black. Eventually gave this PSU to a friend for his build and no issues reported from him either. Pros: -No wiggle. Feels like you got a solid piece of work in your hands. -Large and powerful fan, also helps cool my GPU!!! Other Thoughts: Its really quiet. really don't hear any noise from the PSU at ALL. and 750 Watts? I really don't see how anyone could go wrong with this animal. Other Thoughts: put this in my thermaltake armour quadcase many years ago. I have had. a PS fail with a puff of smoke. this one didn't fail until the house was full of smoke, the fire dept found the cause with a theral imaging camera. It was my pride and joy, I had boasted of my build to a tech in Vancouver about five hours previously. The higher powers punish hubris. Pros: Works great. All the cables feel very solid and well protected. No issues at all. Cons: Is not a modular power supply. Other Thoughts: If you can afford a few more bucks and have limited space inside the case- get a modular power supply. The cable management is so much easier inside the case. Pros: Stable, quiet, it works. PCPC replaced my first unit, with little fussiness. Tech support helpful. Cons: First unit had an internal mechanical rattle. A loose screw or nut. Other Thoughts: Just a caution, and not meant as a criticism of this fine power supply -- think twice about using this PSU with a non- "Pure Sine Wave" UPS. I'm using a slightly older model of this PSU: Silencer PPCS750QBL, now discontinued, but I'm totally happy with it. PC Power & Cooling's tech support promptly replied to my question about its compatibility with UPS's which have a simulated sine wave output - units like many of the Smart-UPS produced by APC / American Power Conversion. "The PPCS750QBL will work with a simulated sine wave, but I recommend you do not. A derived, stepped, or simulated sine wave can damage the active power factor correction in our power supply over time. Typically, a UPS will only go to battery power when there is an interruption in the AC current. This is the only time the sine wave characteristics come into play. If the power supply is exposed to a simulated sine wave for extended periods of time or frequently, the PFC can become damaged and fail prematurely." Pros: Systems specs Amd FX-8350, DDR3 1866 32GB RAM, Gigabyte Radeon HD 7970 GHz edition, 5 hard drives, tv tuner card, Blu-ray Burner, Gigabyte Ga-990fxa-UD3 motherboard, IN WIN Dragon rider case. Until I got my ALL-IN-ONE liquid cooling system, I don't do any over clocking of the CPU, system is dead silent on Idle, or running Cinbench 11.5 multi core CPU bench marks. While playing games the system does get a little noisy, but that is mostly my video card fan making noise. December I got the Thermatake CLW0217 ALL-IN-ONE liquid cooling system, Thermatake fans was too noisy for my taste, used my case fans for my liquid cooling system. On Idle my ALL-IN-ONE liquid system pump is the noises part of the system now. I have my CPU over clocked to 4.5 GHZ at 1.4 volts, I don't try to push it any higher, because that might damage my power supply. I had my system for over 5 months, my system has been rocked sold! Cons: Price, but you get what you paid for. Other Thoughts: Price, but you get what you paid for. Cons: Installed this on a new system and it died within a month. I do think reliability for such a critical part is one of the most important criteria, so I can only give it one star. I have since purchased a high quality Rose**** PSU and am very happy with it.